The periodical of the Caradoc and Severn Valley Field Club that published reports on the club's activities alongside articles on the archaeology, botany, natural history and geology of Shropshire, the Severn Valley and surrounding areas. Originally an annual publication it was published irregularly from 1941 onwards. Amongst the periodical's editors were John L. Hobbs, I. R. Bonner and A. M. Jenkinson. 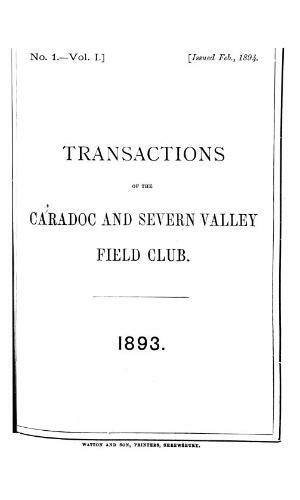 Associated titles: The Caradoc Field Club, Shropshire, Transactions (1869); Transaction of the Severn Valley Naturalists' Field Club (1873) Transactions (incorporating the record of bare facts) of the Caradoc and Severn Valley Field Club (Shropshire) (1943).